The polycystic kidney diseases (PKD) are among the most common hereditary nephropathies and constitute one of the leading causes of end-stage renal disease (1). Autosomal dominant polycystic kidney disease (ADPKD) occurs in 1:1000 individuals, primarily as the result of mutations in one of two genes, PKD1 or PKD2 (2–5). Autosomal recessive polycystic kidney disease (ARPKD) is comparatively less frequent (1:20,000 live births) and results from mutations in a single gene, PKHD1 (6,7). The principal pathologic manifestations in PKD involve the following: (1) the formation of epithelial-lined cysts throughout the nephron in ADPKD (8) and predominantly in the collecting duct in ARPKD (9); (2) alterations in cell polarity; and (3) changes in extracellular matrix composition. In addition to the renal cystic disease, ADPKD is associated with cyst formation in other epithelial organs, most notably the liver and pancreas, as well as connective tissue defects, such as intracranial aneurysms, aortic dissection, cardiac valve abnormalities, and abdominal wall hernias (10). In comparison, the ARPKD phenotype is expressed almost exclusively in the kidney and liver, with the latter involving biliary dysgenesis and portal tract fibrosis (11). Polycystin-1, the protein product of PKD1, is an approximately 460-kD cell membrane-associated glycoprotein with a number of putative adhesion domains in its amino-terminus, 7 to 11 transmembrane domains, and a small intracellular carboxy-terminus (12). Immunohistochemical studies demonstrate that polycystin-1 is developmentally regulated and highly expressed in fetal tissues (13–16). In adult tissues, polycystin-1 is expressed at low levels in the kidney, predominantly in the distal nephron and collecting duct, as well as in the epithelial ducts of the biliary tree and the pancreas (17). Polycystin-2, the protein product of PKD2, is also predicted to encode an integral membrane protein of approximately 110 kD with intracellular amino- and carboxy-termini. The carboxy-terminus contains an EF-hand domain that is predicted to have calcium-binding and regulatory functions (5). Polycystin-2 has significant amino acid homology to the trp family of store-operated (calcium channels 18). Several investigators have proposed that polycystin-1 and polycystin-2 are components of a signaling cascade, with polycystin-1 acting as a receptor for either cell-cell or cell-matrix interactions and polycystin-2 associating as either a homotetramer or heterotetramer with trp channels to function as a regulated ion channel (reviewed in reference (19). Immunostaining of human and mouse renal tissues has demonstrated widespread and developmentally regulated polycystin-2 expression, with the highest level in thick ascending limb and distal convoluted tubule (20,21). In addition to polycystin-directed studies, investigations of PKD pathogenesis have focused on numerous mouse models that arose either by spontaneous mutation or targeted mutagenesis (22). These models mimic human PKD with respect to cyst localization, epithelial polarity defects, and extrarenal manifestations. Among these mutations, the congenital polycystic kidney (cpk) (23) and Oak Ridge polycystic kidney disease (Tg737orpk) (24) mice are the most extensively studied. 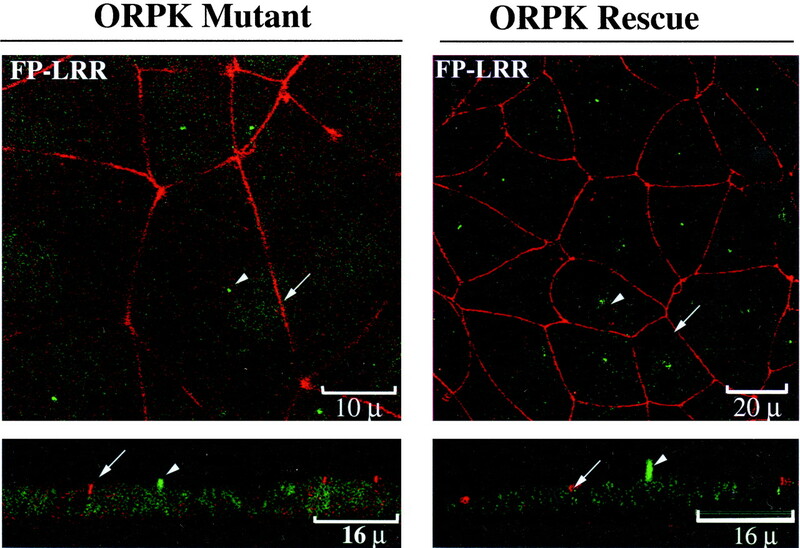 Both cpk and Tg737orpk mutants develop renal cysts and biliary dysgenesis in a pattern that mimics ARPKD. Recent data from these and other mouse models have suggested an association between ciliary dysfunction, embryonic left-right (LR) patterning defects, and cystic disease of visceral organs, e.g., kidney, liver, and pancreas (25–29). For example, the Tg737 gene encodes polaris, a protein which in early embryonic development (embryonic day 7.5) appears to function in ciliogenesis. Targeted deletions of the Tg737 gene cause loss of embryonic nodal cilia, disruption of LR axis specification, and embryonic lethality (30). In contrast, homozygosity for the Tg737orpk hypomorphic allele causes an ARPKD-like phenotype with renal, biliary and pancreatic cysts. Tg737orpk homozygotes have attenuation of the renal epithelial cilia (26,31) and loss of cilia in the ventricular ependymal cell layer (25). Recent studies with the cpk gene product, cystin, provide a second example of this association between cilia and cysts. In mouse cortical collecting duct (mCCD) cells, heterologously expressed cystin co-localizes with β-tubulin IV in the primary apical cilium (27). Finally, the inversion of embryo turning (inv) gene encodes a novel, ankyrin-repeat–containing protein that is ubiquitously expressed in early mouse embryos (32). Although nodal cilia in inv mutants are present and motile, they produce only very weak leftward nodal flow. Nodal flow is thought to be essential for establishing the morphogen gradient that dictates LR body axis specification. Homozygous mutants have reversal of LR visceral asymmetries as well as severely dilated renal collecting ducts, pancreatic abnormalities, including dilatation of the acinar ducts, and anomalies of the extrahepatic biliary system. Investigations in other experimental systems have also demonstrated that PKD protein orthologues co-localize in cilia and that defects in these proteins cause abnormalities of cilia structure and/or function. For example, OSM-5, the Caenorhabditis elegans protein orthologue of polaris, is expressed only in ciliated sensory neurons at the head and tail of the worm, and its function is required for cilia assembly (33). In the male worm, a specialized subset of ciliated sensory neurons co-express OSM-5 and the gene products of lov-1 and pkd-2, the putative orthologues of PKD1 and PKD2, respectively (34). 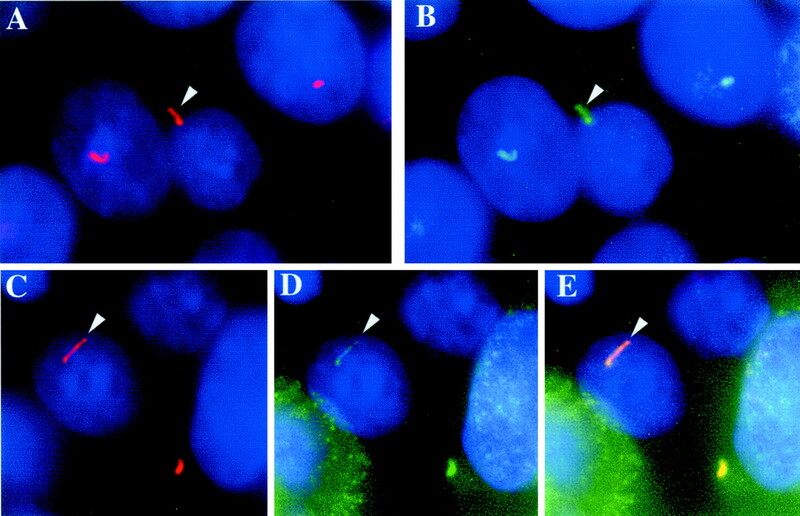 Mutations in the osm-5 gene cause abnormal male mating behavior due presumably to abnormal ciliogenesis and resulting defects in chemosensation and mechanosensation. In contrast, cilia appear to be normal in lov-1 and pkd-2 mutant worms. Yet, despite structurally intact cilia, lov-1 and pkd-2 mutant worms exhibit the same sensory defects in mating behaviors as osm-5 mutants. These data beg the question: are polycystin-1 and polycystin-2, like polaris and cystin, integral to normal ciliary function in ductal epithelia of the vertebrate kidney, liver, and pancreas? To begin to address this issue, we sought to determine whether polycystin-1 and polycystrin-2 co-localize with polaris and cystin in primary apical cilia using an immunofluorescence-based approach with a series of well-characterized antibodies. For our studies, mCCD cells were grown on cell culture inserts to optimize cell polarization and cilia formation. Our data indicate that polycystin-1, polycystin-2, polaris, and cystin co-localize in the cilia of mCCD cells. These data add to a growing body of evidence that suggests that the primary cilium plays a key role in normal physiologic functions of renal epithelia and defects in ciliary function contribute to the pathogenesis of polycystic kidney disease. The 94D renal cell line was isolated by microdissection of cortical collecting duct segments from 21-d old Tg737orpk mice that were heterozygous for the ImmortoMouse transgene (H-2kb-tsA58) (26). The generation of the Tg737 expression construct (Tg737Bap) and transfection of the mouse 94D renal cells was performed using Lipofectamine Plus (Life Technologies GibcoBRL, Carlsbad, CA) as reported previously (26,35). Briefly, the Tg737Bap construct contains the open reading frame of the mouse wild-type Tg737 cDNA under the regulatory control of the human β-actin promoter. This construct encodes a functional polaris protein, as demonstrated by its ability to correct the renal phenotype in Tg737orpk mice. Transfection assays for expression and localization of wild-type cystin were performed as described previously (27) using a mouse cortical collecting duct cell line, mCCD-K2 (gift of Eric Schwiebert and Bruce Stanton, Dartmouth College, Hanover, NH; isolated as described in reference 36). Stable cell lines were established for the transgene by drug selection with 15 mg·ml−1 Blasticidin. For expression studies in polarized epithelium, cells were plated at confluence on 6-mm Falcon cell culture inserts (#3104; Becton Dickinson, Franklin Lakes, NJ). Immunolocalization studies were then performed after 3 to 4 d in culture. Cells were grown in DMEM-F12 medium containing Earle balanced salt solution (Cellgro; Mediatech, Inc., Herndon, VA), supplemented with 10% fetal bovine serum (Hyclone, Logan, UT), 100 U/ml penicillin, and 100 mg/ml streptomycin, in 5% CO2/95% air at 37°C. For immunofluorescence localization of proteins, cells were fixed in 4% paraformaldehyde, 0.2% Triton in phosphate-buffered saline (PBS) for 10 min and incubated in blocking buffer (1% bovine serum albumin in PBS) for 30 min followed by 60-min incubation with the primary antibodies diluted in blocking buffer. The primary antibodies used in this study include the anti-myc mouse monoclonal (R950–25 diluted 1:250; Invitrogen Corp., San Diego, CA), anti-β-tubulin IV mouse monoclonal antibody (Mu178-UC diluted 1:200; BioGenex Laboratories, San Ramon, CA), anti-polaris affinity-purified rabbit polyclonal antibody (GN593 diluted 1:200) (25), anti-ZO1 (rat monoclonal, diluted 1:2 to 1:5; gift of Daniel F. Balkovetz, University of Alabama at Birmingham), affinity-purified anti-polycystin-1 rabbit polyclonal antibody (PC1-mpkcr, diluted 1:1000) (13), affinity-purified anti-polycystin-1 rabbit polyclonal antibodies (FP-LRR and Mal-BD3, diluted 1:100) (14), and anti-polycystin-2 rabbit polyclonal antibody (YCC2, diluted 1:500) (37). After washing with PBS, cells were incubated for 1 h with a series of different fluorochrome-conjugated secondary antibodies (diluted 1:200 in blocking buffer). These secondary antibodies include goat anti-rabbit Oregon Green (O-6380; Molecular Probes, Eugene, OR), donkey anti-rabbit IgG FITC (711-096-152; Jackson ImmunoResearch Laboratories, West Grove, PA), donkey anti-mouse IgG-Rhodamine Red-X (715-295-150; Jackson ImmunoResearch Laboratories), and donkey anti-rat Rhodamine Red-X (712-295-153; Jackson ImmunoResearch Laboratories). Nuclei were stained for 5 min using Hoechst No. 33528 (Sigma, St. Louis, MO) diluted 1:1000 in PBS. In all cases, antibody controls were evaluated to ensure that the results were not a consequence of crossreactivity or nonspecific binding of the secondary antibodies. Fluorescently labeled mCCD cell cultures were analyzed using either a Leica fluorescence microscope equipped with a Hamamatsu C5810 digital camera or a Leica Confocal Laser Scanning Microscope System configured with both an Argon Ion (5 mW, 488 nm) and a Krypton Ion (10 mW, 568 nm) laser. The captured photomicrographs were labeled using Adobe Photoshop. The subcellular localization of endogenous polycystin-1 was evaluated in wild-type mCCD cells grown on cell culture inserts for a minimum of 3 d postconfluence to allow epithelial polarization and cilia formation. Immunofluorescence analysis revealed that the affinity-purified, polyclonal antisera directed against the amino-terminus (PC1-FP-LRR) as well as the carboxy-terminus (PC1-mpkcr) of the protein detected a small domain on the apical cell surface (Figure 1). In broad field views collected as confocal images at the apical membrane (Figure 1, A through C and E through G), polycystin-1 was positioned in the center of cell, as outlined by tight junction staining with anti-ZO1 (38). In Z-sections collected along the entire apical-basal axis of the mCCD cells (Figure 1, D and H), polycystin-1 was detected above the apical membrane (arrowhead in top third of panel D) in a distribution that co-localizes with β-tubulin IV, a known constituent of the ciliary axoneme (arrow in middle third of panel D and merged image [yellow] in bottom third of panel D). Both antibodies also detected polycystin-1 at low levels in the cytoplasm. PC1-mpkcr, the antibody directed against the polycystin-1 carboxy-terminal domain also detects an enriched signal at the lateral membrane below ZO1 (green arrowhead in bottom third of panel D) in a pattern similar to that previously reported (14,39). Figure 1. Localization of polycystin-1 (PC1) in mouse cortical collecting duct (mCCD) cells. Wild-type mCCD cells were grown on cell culture inserts for a minimum of 3 d postconfluence to allow full polarization and cilia formation. Localization of PC1 was determined by immunofluorescence using two different anti-PC1 antibodies with confocal images captured at the level of the apical membrane. In Panels A and D, cells were probed with rabbit anti-PC1-mpkcr antibody (green; arrowhead in panel A; arrowhead in top third of panel D), rat anti-ZO1 monoclonal antibody (red; arrow at cell-cell junctions in panels B and D), and mouse anti-β-tubulin IV antibody (red in the center of the cells; arrowhead in panel B; arrowhead in middle third of panel D). The apical domain of PC1 co-localized with the β-tubulin IV in cilia (arrowhead in merged images in panel C and bottom third of panel D). Localization was also detected in the lateral membrane (green; arrowhead in bottom third of panel D) just beneath the tight junctions (white arrow in panel D), as revealed by ZO1 staining in the Z-section. In panels E through H, similar localization studies were performed with a second affinity-purified polycystin-1 antibody (PC1-FP-LRR). In this study, the anti-β-tubulin IV antibody was omitted to reduce potential spectral overlap between the polycystin-1 and β-tubulin IV signals. Cells were polarized for 3 d postconfluence on cell culture inserts and then immunoprobed using rabbit anti-PC1-FP-LRR (green; arrowheads) and rat anti-ZO1 (red; arrows). Similar to the results obtained with anti-PC1-mpkcr, PC1-FP-LRR was detected as a single domain (arrowheads in panels E, G, and H) on the apical membrane surface. All images were captured using sequential FITC and Texas Red scans on a Leica DMIRB laser confocal microscope or conventional inverted microscope to eliminate bleed-through signals from the green and red fluorescence. Of note, the studies represented in panels A through D of Figure 1 involved three antibodies, PC1-mpkcr (green) as well as anti-ZO1 and anti-β-tubulin IV (both red). To minimize potential artifact due to spectral overlap of the fluorophores, we repeated these studies using a second polycystin-1 antibody, PC1-FP-LRR (green) and anti-Z01 (red), but omitting the β-tubulin antibody (Figure 1, E through H). Similar to the results obtained in panels A through D, polycystin-1 was detected in the cilium in the absence of β-tubulin IV staining. No immunofluorescence signal was detected when secondary antibodies were used alone or in combination (data not shown). The localization of polycystin-2 was determined in polarized mCCD cells cultured for 3 d postconfluence on cell culture inserts. Figure 2 shows cells immunoprobed with rabbit anti-PC2-YCC2 antisera (panels B and D) and with a mouse monoclonal anti-β-tubulin IV antibody (panels A and C). Polycystin-2 co-localized in a central apical domain with β-tubulin IV (arrow in Figure 2E) similarly to the pattern seen for polycystin-1. In some cells, polycystin-2 was also present with a punctate pattern in the cytoplasm (Figure 2, D and E). Figure 2. Localization of polycystin-2 (PC2) in mCCD cells. The localization of PC2 was determined in polarized mCCD cells cultured for 3 d postconfluence on cell culture inserts. Cells were immunoprobed with rabbit anti-PC2-YCC2 antibody (green; arrowheads in panels B and D) and with a mouse monoclonal anti-β-tubulin IV antibody (rd; arrowheads in panels A and C). PC2 was detected on the apical surface of the cell in a domain that co-localized with β-tubulin IV (arrowhead in merged image E). In some cells, PC2 was also present in a punctate pattern within the cytoplasm (green in panels D and E). Nuclei (blue) were identified by Hoechst staining. We next sought to determine whether the PKD-related proteins, polycystin-1, polycystin-2, polaris, and cystin, are co-expressed in the primary cilia. These analyses were complicated by the fact that the antisera recognizing the polycystins and polaris were generated in rabbits, and thus we could not discriminate among the primary antisera using anti-rabbit secondary antibodies. We therefore examined the coexpression of each of these proteins relative to epitope-tagged cystin. Stably transfected mCCD-K2 cell lines exogenously expressing myc-tagged cystin were immunostained with PC1-FP-LRR (green in top panels in Figure 3A), anti-polaris [GN593] (green in top panels of Figure 3B), and PC2-YCC2 (green in top panels of Figure 3C). Localization of epitope-tagged cystin was determined using the mouse anti-myc monoclonal antibody (red indicated by arrowhead in middle panels). Cell junctions are indicated by ZO1 staining (red marked with arrows in middle panels). Merged images shown in the bottom panels of Figure 3 reveal co-localization of each of these proteins with epitope-tagged cystin in the renal cilia (yellow marked with an arrowhead). Figure 3. Localization of PC1, polaris, PC2, and cystin in the renal epithelial cilium. To evaluate whether the cystic kidney disease–related proteins are all co-expressed in cilia, stable mCCD cell lines exogenously expressing myc-tagged cystin were immunostained for PC1 (green in top panels of A), polaris (green in top panels of B), and PC2 (green in top panels of C). The apical focal plane was used to capture the cilia (arrowheads in left panels of A and B and in C) and the position of the tight junctions, indicated by ZO1 staining (arrows). The nuclei (blue) were identified by Hoechst staining. Z-sections are shown for PC1 (right panels of A) and polaris (right panels of B). Localization of cystin was determined using the mouse anti-myc monoclonal antibody (red; arrowheads in middle panels of A, B, and C). Merged images shown in the bottom panels reveal co-localization of PC1, polaris, and PC2 with epitope-tagged cystin (yellow; arrowheads in bottom panels of A, B, and C). Barr et al. (40) have proposed that cilia may be required for the function of vertebrate polycystins. If so, the PKD phenotype expressed in Tg737orpk mice may be due either to improper targeting of polycystins to the cilia or to an indirect effect of cilia dysgenesis on polycystin function. To evaluate whether polaris plays a critical role in targeting polycystin-1 to the primary apical cilium, we analyzed the localization of polycystin-1 in the 94D mutant renal cell line and 94D cells stably transfected with the Tg737Bap transgene (Figure 4). With tight junctions labeled by antibodies against ZO1, immunofluorescence using the PC1-FP-LRR antisera demonstrates a small domain on the apical cell surface of both cell lines. There is no apparent difference in the levels of polycystin-1 expression between 94D mutant cells and 94D Tg737Bap-rescued lines, although comparative inspection of the cilia in multiple Z-sections indicates that the size of the polycystin-1 domain was significantly reduced (<1 micron) in mutant cells relative to that in the rescued cells (3 to 4 microns). Similar results were obtained with the PC1-mpkcr antisera (data not shown). These data indicate that targeted cilia expression of polycystin-1 is conserved in mouse cortical collecting duct cells expressing mutant polaris. These observations contrast with those made in the nematode C. elegans, where OSM-5 (the polaris orthologue) is reportedly required for normal targeting of the polycystins to male-specific cilia (40). Figure 4. Expression of polycystin-1 in Tg737orpk mutant and rescued cell lines. Polycystin-1 localization was analyzed using either PC1-FP-LRR and PC1-mpkcr antisera in the 94D renal cell line derived from Tg737orpk mutant collecting duct cells and the same cell line transfected with Tg737Bap, a Tg737 expression construct. This construct has been shown previously to correct the cystic kidney lesions in the Tg737orpk mice. Tight junctions were labeled using antibodies against ZO1 (red). In the left panel, immunofluorescence with the PC1-FP-LRR antisera demonstrates a small domain on the apical cell surface (green) in 94D mutant cells. The same pattern was observed in 94D cells stably transfected with Tg737Bap (right panel) and stained with PC1-FP-LRR. In Z-section analysis (bottom panels), polycystin-1 was detected in the stunted cilium (<1 micron) of the 94D cells. In the rescued lines, the ciliary defect was corrected, resulting in cilia of 3 to 4 microns in length and a larger domain of PC1 extending from the apical surface of the cell. The immunofluorescence images are representative of three experiments in both the mutant and rescued cell lines and analysis of a minimum of ten cilia in each cell line. We used an immunofluorescence-based approach with a series of previously well-characterized, polyclonal antisera against polycystin-1, polycystin-2, and polaris, as well as antibodies directed against epitope-tagged cystin to examine the association between these PKD-related proteins and the primary apical cilia of renal epithelia. Our studies were conducted in mCCD cells grown on cell culture inserts for 3 to 4 d postconfluence to allow full epithelial polarization and cilia formation (25). Antibodies directed against the amino- as well as the carboxy-terminus of polycystin-1 demonstrate that the endogenous protein is expressed in the primary cilium and co-localizes with β-tubulin IV, a known component of the ciliary axoneme. We also detected polycystin-1 in the cytoplasm as well as an apparent increased signal intensity at the lateral membrane, just below the level of the tight junctions. Similarly, antisera directed against the carboxy-terminus of polycystin-2 detected the protein in primary cilia. In several cells, polycystin-2 was also present in a punctate pattern within the cytoplasm. Previous subcellular localization studies using the same antibodies have yielded somewhat different results. The PC1-FP-LRR antibody, generated against a fusion protein containing residues 27 to 360 of human polycystin-1, detected the protein in the cytoplasm as well as in the lateral membrane of cultured human proximal tubular cells (14) and co-localization with desmoplakin in MDCK cells (41). Immunoprecipitation studies performed with the PC1-mpkcr antibody raised against a recombinant protein containing the carboxy-terminal 219 residues of mouse polycystin-1 indicated that the protein was predominantly membrane-associated. Scheffer et al. (39) examined polycystin-1 expression in MDCK cells using an additional suite of polyclonal antibodies and demonstrated that the endogenous protein co-localizes with desmosomes but not with tight or adherens junctions. The expression of endogenous polycystin-2 also has been similarly analyzed by immunofluorescence in a variety of renal cell lines, including MDCK cells, Cos-7 cells, LLC-PK1 cells, and mouse IMCD3 cells. These studies have demonstrated basolateral membrane (21,42), endoplasmic reticulum (20), or the Golgi apparatus (42) localizations for the endogenous polycystin-2 protein. Cilia localization of either polycystin-1 or polycystin-2 has not been reported previously, despite the fact that renal tubular cells from the proximal tubule to the collecting duct, with the exception of intercalated cells, express a solitary cilium on their apical surface (43,44). In tissue sections, renal epithelial cilia are difficult to detect by immunofluoresence because they are small, single structures that extend from the relatively large surface area of the apical membrane. Among the numerous cilia-expressing cell lines derived from mammalian kidneys, MDCK principal cells have been the most extensively studied, and expression of the primary cilium appears to be modulated by the culture conditions. Cilia are not evident in MDCK cells cultured for up to 4 d after splitting on glass coverslips, whereas cells cultured for 4 to 8 d exhibit cilia that are 5 to 8 μm in length (45). Of note, previous polycystin subcellular localization studies were conducted primarily in cells cultured on glass surfaces for less than 72 h before fixation. We suggest that these conditions are not optimal for cilia formation; therefore cilia localization of polycystin-1 and polycystin-2 could have been missed. In C. elegans, orthologues of the PKD-related proteins, polycystin-1 (LOV-1), polycystin-2 (PKD2), and polaris (OSM-5), co-localize in cilia of male-specific sensory neurons, and defects in these proteins cause abnormalities of cilia structure and/or function. Barr et al. (40) have suggested that similar to the male-specific cilia of C. elegans, the vertebrate polycystins may be localized to the primary cilia of renal epithelial cells and that intact cilia may be required for their proper biologic function. If so, the PKD phenotype exhibited in Tg737orpk mice may be attributed either directly to improper targeting of polycystins to the stunted cilia or to an indirect effect of cilia dysgenesis on polycystin function. We therefore sought to examine whether polaris is required for cilia-targeting of polycystin-1 by comparing the localization of endogenous polycystin-1 in the 94D renal cell line derived from Tg737orpk mutant collecting duct cells and in 94D renal cells stably transfected with the Tg737Bap transgene. Although the transgene restored the formation of cilia with nearly normal length, the localization and expression level of polycystin-1 was not significantly altered in the rescued versus mutant cell lines and the pattern of polycystin-1 expression in both lines resembled that in wild type mCCD cells. Therefore, the PKD phenotype expressed in Tg737orpk mice is more likely the result of cilia dysgenesis and the associated dysfunction than improper targeting or misexpression of polycystins within cilia. Cilia are built and maintained by a process called intraflagellar transport (IFT) in which ciliary axoneme proteins assemble into large raft structures at the basal bodies. IFT rafts are then transported from the basal bodies toward the distal tip of the cilium and back toward the basal bodies by kinesin and dynein motor proteins, respectively (46). The functions and possible interactions of polycystin-1, polycystin-2, polaris, and cystin in cilia formation and/or function remain to be elucidated. Previous studies have demonstrated that polaris is critical for generating and maintaining the structural integrity of cilia (26,31,33,40). On the basis of its predicted protein structure and experimental data demonstrating that active taxanes attenutate the renal cystic disease in cpk mice, we speculate that cystin acts as part of a molecular scaffold that stabilizes microtubule assembly within the ciliary axoneme (27). How does the function of the primary apical cilium contribute to normal physiologic processes in renal epithelia and what role might the polycystins play in these processes? Recent data indicate that the primary apical cilium in renal epithelia functions as a mechanosensor (47), with flow-mediated deflection of the cilium causing calcium influx through mechanically sensitive channels localized along the axoneme or at the base of the cilium (45). Given that polycystin-1 and polycystin-2 have been shown to interact directly (48,49) to form a novel membrane cation channel (50) and that both polycystins are detected in cilia, we speculate that these proteins may function together to transduce mechanical (or chemical or osmotic) signals via a calcium-mediated signaling cascade. We also note that Satlin et al. (51) have recently demonstrated that net sodium reabsorption in the collecting duct is regulated by tubular flow rate. Although this process has not been related directly to cilia function, it will be interesting to evaluate whether flow-regulated sodium reabsorption is altered in renal epithelial cells with aberrant cilia structure and/or function. Emerging data suggest that once cilia assemble, IFT may facilitate the transport of ion channels, receptors, signal transduction components, and transcription factors into the cilia axoneme, where they are modified by environmental factors and then returned to the cytoplasm to modulate cellular processes, which may include sodium reabsorption, transepithelial fluid transport, and cell proliferation (52). Therefore, far from being a vestigial organelle as long thought, the primary apical cilium may play an integral role in modulating physiologic processes of terminally-differentiated epithelia. This model is consistent with the hypothesis proposed by Barr et al. (40) that the PKD phenotype with its associated tubuloepithelial differentiation defects may result from any gene mutation that disrupts the ability to assemble or maintain cilia structure or function. Further analysis of the PKD-related proteins and their cilia-specific function should permit a more thorough investigation of the role cilia play in differentiation and maintenance of the polarized epithelial phenotype and provide insights as to how defects in cilia function contribute to the pathogenesis of polycystic kidney disease. The authors thank James Schafer, PhD for critically reviewing the manuscript. We thank Jing Zhou (Harvard Medical School, Boston, MA) for providing the polyclonal antibody, mpkcr; Katherine Klinger (Genzyme Corp., Framingham, MA) for providing the polyclonal antibodies, FP-LRR and Mal-BD3; and Stefan Somlo (Yale University, New Haven, CT) for providing the YCC2 polyclonal antibody. This work was supported by National Institute of Health Grants RO1-DK55534 (LG-W) and RO1-DK55007 (BKY).